Criteo is sunsetting their old SOAP API in favour of a new REST API. Funnel started supporting the new API a few months ago, and now it’s time to disable the old API integration. Fortunately, it’s easy to do upgrade and you’re able to do it on your own. 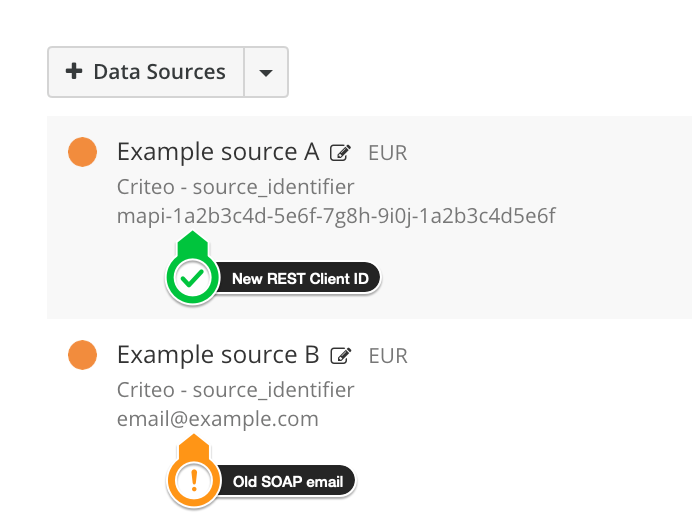 Simply re-connect your existing data sources in Funnel with your new Criteo REST API user and the upgrade is complete. Sources using an old SOAP API user will stop working on Jan 7th 2019. For each Criteo source that is not yet upgraded, press reconnect and enter your Client ID and Client Secret. That’s it! The re-connected data sources are now running on the new API. Below you find some Q&A regarding the upgrade. Please reach out to the Funnel team if you need any help with the upgrade. How can I tell if a Criteo Data Source has been upgraded? Data sources using the old SOAP API has an email address in data sources page. Data sources using the new REST API has a Client ID (starting with mapi-). What is the email looking text visible next to the source? A text looking like an email address may still be visible on the source. It is simply the data source identifier in Funnel. You don’t need to worry about this value - if you have reconnected the source and it now uses a Client ID (see above) you’re good to go. First of all, make sure that the Client ID / Client Secret you used has access to the account you are trying to re-connect. It’s quite easy to enter the credentials of a different account, so take a quick look and verify this. If you’re sure the credentials have access to the account, this error could occur if the account name in Criteo has been changed. If this is the case, please contact our support and we’ll help you out!